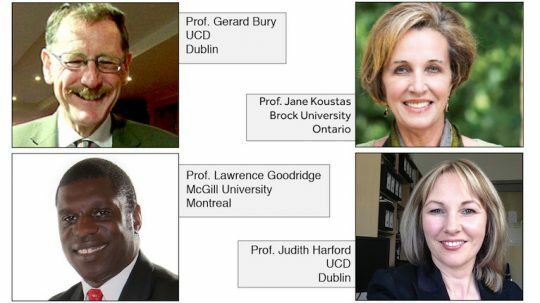 Honoring the life and work of Canada’s former Minister for Finance, James M. Flaherty, the objectives of this program are to build on the network of academic links between Canada and Ireland, resulting in increased academic co-operation, greater inter-cultural understanding and the potential for increased trade between both countries. Professor Gerard Bury is from University College Dublin and is visiting the University of British Columbia and Sunnybrook Centre for Prehospital Medicine for his work in the field of Health. Further information here. Dr Judith Harford is from University College Dublin and is visiting the University of Toronto for her work in the field of Education. Further information here. Dr Lawrence Goodridge is from McGill University and is visiting University College Dublin for his work in the field of Agriculture. Further information here. Professor Jane Koustas is from Brock University and is visiting University College Dublin for her work in the field of Arts and Humanities. Further information here. Graham Cross is from Trinity College Dublin and is visiting the University of British Columbia to conduct research in the field of Physical Sciences. Further information here. Aileen Doran is from University College Dublin and is visiting Memorial University to conduct research in the field of Physcial Sciences. Further information here. Mairead Foody is from Dublin City University and is visiting Memorial University to conduct research in the field of Education. Further information here. Thomas Hughes is from NUI Galway and is visiting York University to conduct research in the field of Humanities. Further information here. Andrew McKay is from Trinity College Dublin and is visiting the University of British Columbia to conduct research in the field of Engineering and Engineering Trades. Further information here. Seona Rossi is from the Royal College of Surgeons in Ireland and is visiting the University of Toronto to conduct research in the field of Biological and Related Sciences. Further information here. Elaine Toomey is from NUI Galway and is visiting Western University to conduct research in the field of Health. Further information here. Anna Colavecchio is from McGill University and is visiting University College Dublin to conduct research in the field of Biological and Related Sciences. Further information here. Nathan Hall is from University of Winnipeg and is visiting University College Dublin to conduct research in the field of Education. Further information here. Matthew Hunt is from McGill University and is visiting University College Cork to conduct research in the field of Information & Communication Technologies. Further information here. Elham Salimi is from University of Manitoba and is visiting the National Institute for Bioprocessing Research and Training (NBIRT) in Dublin to conduct research in the field of Biological and Related Sciences. Further information here. Maxime Sasseville is from Université de Sherbrooke and is visiting the HBR Centre of Primary Care Research in Trinity College Dublin to conduct research in the field of Health. Further information here. Taisiya Sigaeva is from University of Alberta and is visiting NUI Galway to conduct research in the field of Mathematics and Statistics. Further information here. Samantha Twietmeyer is from Queen’s University Ontario and is visiting Queen’s University Belfast to conduct research in the field of Social and Behavioural Sciences. Further information here. These awards are provided with the assistance of the Government of Canada, via the International Education Division of Global Affairs Canada, and with the assistance of the Irish Government, via the Emigrant Support Programme, administered by the Department of Foreign Affairs.